Sky Walk offers a more peaceful introduction to exploring Arenal Rain Forest on a 4km (2.5mi) circuit trail that snakes through distinct levels of the wonderfully diverse ecosystem. Explore the mountain in a fun and very exciting way. This tour has two different activities that provide the visitor an excellent opportunity filled with emotions and sensations that will satisfy the most adventurous tourists. Once down, the River Drift adventure will start, traveling on an exciting tour through the Piedras Negras River. 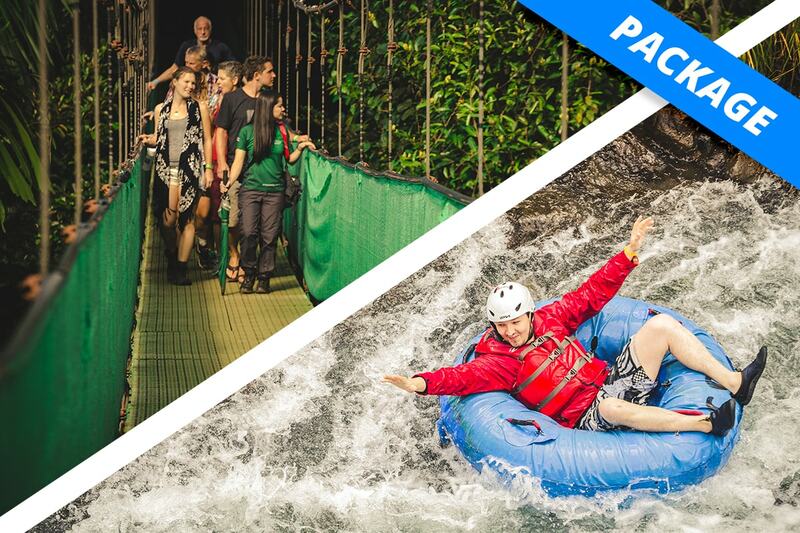 Sky River Drift is a fast water path with controlled rapids travelled on individual rafts. The thrill of being carried by the current towards the rapids and the force of inertia that dominates the raft is a mixture in which any adventurer will be satisfied in their pursuit of adrenaline and fun.